LOS ANGELES—I’ve been producing The Brazilian Heart Celebration here since 2012. In 2014, the annual show was transformed into a one-night musical because of my desire to speak about what links us all: our humanity. This year, I chose a theme that it is as special as it is timeless: Immigrants. 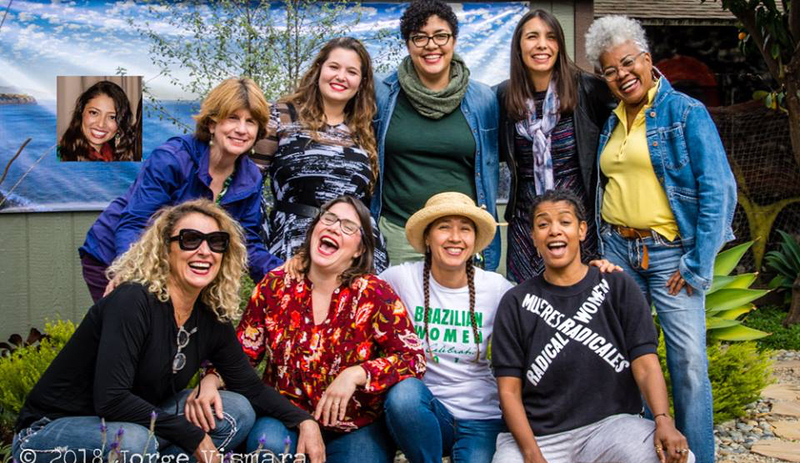 With a cast of eight female Brazilian singer-songwriters, the 2018 show interweaves poetry, quotes, and stories in English with songs related to different aspects of being an immigrant—an inner one and an outer one. I believe that talking about immigrants in Brazil and beyond gives the audience an opportunity to reflect about their own ancestors’ path in the U.S.—or anywhere. We’ll be sharing songs in some of the languages that created Brazil’s melting pot: Portuguese, of course, but also Italian, Japanese, French, Yoruba, Pareci (an indigenous Brazilian tribal language), English, and Spanish. One of the songs that move me is Caetano Veloso’s Sampa, from the 1970s. Sampa is an ode to the city of São Paulo, in which he describes his political, social, and emotional impressions as an immigrant from Bahia, a state more than a thousand miles north. “When I looked at you I didn’t see my face. I called you bad taste, bad taste, bad taste. Caetano’s insight made me think of the first time I visited New York City. It was too cold, there were too many buildings, and graffiti made the subway look dirty and aggressive. Who was I then? Who am I today? I answer my question when I sing “Fado Tropical” by Chico Buarque. In it, he paints Brazil as a mixture of plants from Portugal with the arid land of Brazil’s Northeast: Brazil would be a tropical wine made of liqueurs carried in moringas (earthenware jars). I believe that Brazilians don’t know Brazil, just as Americans don’t know the United States. Proof of this is how surprised Americans are when they see how polarized this country is right now. It’s not so different in Brazil. Many people cannot even imagine actually getting to know each other. In one of the first scenes of the show we mention that we learned some Indigenous tribal words in school. But now some of us know that there are 276 Indigenous languages in our country, and that makes us think of the enormity of the Brazilian world still unknown to us. No doubt we will include this one in the musical. I can’t help loving the research process of creating every show. This year I discovered that when French singer Edith Piaf was performing at Copacabana Palace in Rio de Janeiro she became a fan of the Brazilian singer Marlene. Their friendship led to Piaf’s inviting her to open her show at the Olympia in Paris. I also found out that many Polish women who fled during World War I ended up working as prostitutes in Rio de Janeiro. One of them became the mother of Jacob do Bandolim, a master of choro music in Brazil, and one of our honorees this year. What fun to educate myself and create a show! What started in 2012 as just a way of paying homage to historical Brazilian singer-songwriters who were generally unrecognized in the U.S. has become a source of infinite pleasure. This year the script was again written in collaboration with Brazilian actress Mariana Leite, who has been supporting this musical theater adventure for the past four years. But let me open my heart a little more. After many years as a fisherman working off the coast of Brazil, my Portuguese grandpa and his older sons brought my mom to the state of Amazonas and put her in a boarding school run by Catholic nuns. My mom imagined she’d be a nun herself, but changed her mind when she met my dad, Antonio, in Rio de Janeiro. Many years after that, I came to California to spend a year with my then-husband. I was lucky. Brazilian music was joyful and attractive. Art sustained me. I danced samba, I sang in clubs, bar mitzvahs, festivals, and did dubbing sessions. My marriage did not succeed, but the creativity in me blossomed. All the bands in which I participated had North American, Latin and European musicians who loved Brazilian music. But there are other things that concern me more. Why is it so difficult to find a doctor who gives you more than ten minutes of attention, and why do they treat each symptom separately, like they forget that everything’s linked? Why do Americans not see that buying guns so easily is linked to the constant massacres? Duh! Also, why do so many people still think Brazilians speak Spanish? Okay, Kátia, chill out! The truth is, I still confront certain situations like an immigrant. I want to live in the moment, moment by moment, but I still hesitate when faced with something I haven’t done before, something new. To be in the moment is like facing a different culture. We all have two choices: Embrace it or run! I think a healthy melting pot is made of embraces. Far from the whip of suffering! Love letters, hot air balloons! Was best for me to ash! “No! It won’t be like that! Get married, wash and iron! Who told me to fight? Who told me to pray? Who told me? Who told me? Hodgepodge in my head, Mistureba! Is our use of English creating a fence? Or a wall? Will abide by the voice of consciousness and compassion. The 7th Brazilian Heart Celebration takes place on one night only, Sat., March 3 at 7 pm and 9 pm at the Kelman Theater in the Electric Lodge, 1416 Electric Ave., Venice, CA 90291. Featured performers include Ana Gazzola, Clarice Cast, Kátia Moraes, Liz Kinnon, Marcele Berger, Mariana Leite, Nana Nuki, Nando Duarte, Natália Spadini, Sonia Santos, Thalma de Freitas, and special guests. Parking is complimentary for patrons arriving at least 20 minutes before each performance. Translations and adaptations by Peter Lownds. Kátia Moraes began her career in Rio de Janeiro in the 1980s with her band “O Espírito da Coisa.” Since then she has performed and/or recorded with top Brazilian and North American talents. After moving to Los Angeles in 1990, she started lending her voice to films and television for dubbing. She is currently nominated for a 2018 Brazilian International Press Award under two categories: Female Singer and Musical Presentation.